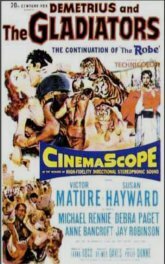 Twentieth Century Fox hit paydirt in September 1953 with the much ballyhooed exhibition of the first ever CinemaScope widescreen presentation THE ROBE. 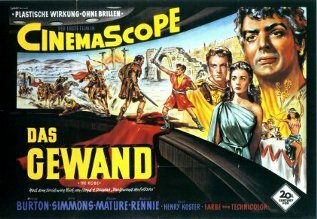 The culmination of years of development by French scientist Professor Henri Chretien, Hollywood mogul Darryl F.Zanuck recognised a great gimmick when he saw it and wisely took an option on the process and applying the trade name 'CinemaScope'. 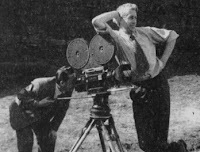 CinemaScope was a means of optically squeezing an image vertically in camera during the original photography by shooting through a specially engineered elongated anamorphic lens and presenting that same processed and edited 'squeezed' footage later in cinemas by projecting that same squeezed footage back through, in essence the same lens, though this time orientated to horizontally unsqueeze the compressed image to a considerable width, generally two and a half times the width of standard 'flat' 35mm exhibition (2.35:1). Though fraught with problems, notably related to distortion, excessive compression around the sides of the frame and focusing limitations - not to mention the sheer size of the actual Bausch and Lomb manufactured lens, which was an enormous hunk of glass, the process was a huge hit. The 'fine print' in this new sensation for exhibitors was the reality that tens of thousands of cinemas worldwide were required to spend considerable amounts in refitting new super sized screens - which given that the existing proscenium of the majority of cinemas built prior to 1953 were strictly intended to showcase a standard sized screen of approximately 1.66:1 ratio (at best) - and tiny little screens they were at that! I know of several instances of cinemas here in New Zealand where a cut price version of CinemaScope was adopted by cheapskate exhibitors whereby the new scope footage was indeed projected through the sparkling new anamorphic lenses onto the crummy old 'flat' screens, with some two thirds of the image deliberately cropped off in the projection window with cardboard. I myself saw IT'S A MAD, MAD, MAD WORLD and FREEBIE AND THE BEAN on a bizarre double feature at the long deceased Classic Cinema, Auckland (definitely a cheapskate outfit whereby the cinema mensroom door was actually on the corner of the screen, so every time some guy went to the can this little rectangle at the left edge of the screen would open and a bizarrely illuminated patron visible for all to see, and scoff at!). True story folks. 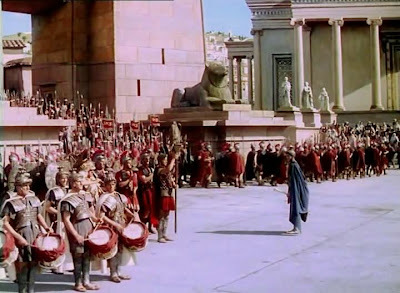 THE ROBE was an okay show I suppose - certainly yards better than the awful, utterly forgettable sequel DEMETRIUS AND THE GLADIATORS that just screams out 'quick cash in' all the way to the box office.. THE ROBE was a tad overly theatrical for my tastes with Jay Robinson chewing the scenery like an out of control grizzly bear. I half expected to learn of a lion tamer popping in between takes with a chair and a whip to quell Robinson and throw him some some tasty treats! As an effects show it's interesting, though I've yet to see a decent transfer of it. 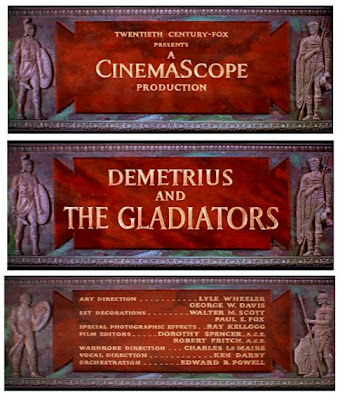 Both this and it's diabolical sequel DEMETRIUS AND THE GLADIATORS are on shabby dvd transfers filled with grain and colour shift. The resulting matte composites look very messy indeed, as dupes to begin with you're dealing with the devil, so with poor transfers of duped effects shots, often duped again as part of the interminable lap dissolves that directors of this genre were fond of, you don't see the painted mattes at their best by any means. 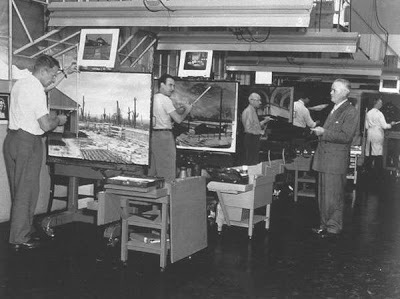 The 20th Century Fox matte department around 1953 while still under the control of long time head Fred Sersen (seen at right). The matte painters pictured here are, from left, Ray Kellogg, Lee LeBlanc, Cliff Silsby, Emil Kosa jr and lastly Max DeVega right down the far end. A wonderfully revealing photograph of matte artists at work in one of the busiest effects departments in Hollywood. Long time Fox matte artist and effects man Ray Kellogg supervised on both of these shows and the normal group of effects people were used - senior matte painter Emil Kosa jr, artists Matthew Yuricich and Menrad von Muldorfer, Cliff Silsby and maybe Lee LeBlanc in addition to visual effects cameramen Harry Dawes and L.B Abbott. So without further ado, we'll take a look at the mattes from both of these pictures. The mattes unfortunately suffer on the appalling Fox DVD release with excessive grain and bizarre colour shift, not helped at all by the fact that most of the painted effects occur during lap dissolves. Anyone who's seen any number of fifties technicolour films can vouch for the utterly dreadful quality of the dissolve opticals where suddenly a few seconds preceeding the effect the film stock noticeably changes (for the worse) and all semblance of normal colour goes straight out of the window only to be 'spliced' back to the original print at the close of the optical transition. I pity the cinematographer and effects artist who saw their work reduced to this state time and time again. I rather like this shot, though once again the colour grading is not befitting of the dvd format and resembles the sort of awful old muddy 16mm television transfers we used to have to put up with. I'm surprised that this shot even made the final cut. Again dreadful colour grading and matching of plate to artwork. I'd be interested in checking out a Blu Ray of this title, even though I personally don't feel that high definition format is here to stay if the ad-hock marketing and piecemeal release calenders are any guideline. This quite nice, expansive matte was probably painted by Matthew Yuricich. 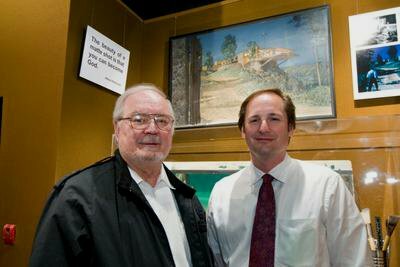 Veteran matte artist Matthew Yuricich seen here recently (circa 2007) attending an exhibition of traditional matte art hosted by visual effects supervisor and former ILM matte cinematographer Craig Barron. The painting seen behind Craig is one of Matthew's wonderful matte paintings from Hitchcock's terrific NORTH BY NORTHWEST. As previously mentioned, this film has virtually nothing to reccommend it, with dismal performances (did Victor Mature ever present anything of himself other than dismal?) and an air of desperate cheapness that hangs over the entire film. 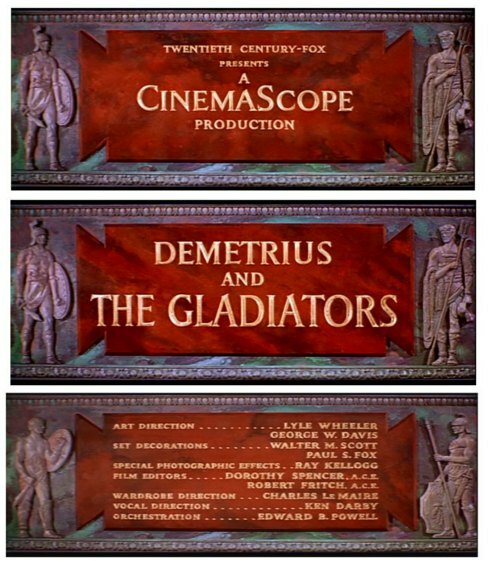 I have only included the few original mattes used in DEMETRIUS AND THE GLADIATORS. Several of the other shots are just mattes from THE ROBE. Again I presume Matthew Yuricich would have painted on this show. An unusual composition for such a matte shot with unnecessary foreground pillars somewhat ruining the shot. I was only ever going to do a couple of 'Epic' blogs but upon a couple of recommendations from like minded fans of 'visual effects old school', I have continued this series, as I do after all have a zillion old matte shot frames gathering dust (or whatever they gather in a computer).... so without further ado, on with the first of today's double feature, ALEXANDER THE GREAT (1956). Not to confused with the convoluted, out of control ego trip that Oliver Stone turned out a few years back, this Robert Rossen version with Richard Burton, although no masterpiece, wasn't too bad and at least got to the point and stayed there. Of course Dickie Burton was afraid by now of being typecast in this sort of thing as he'd just done the big Fox biblical epic THE ROBE (next installment on the very matte shot blog you are reading at this exact moment) though I think he's good at this type of thing, being principally a stage actor and a Shakespearian one at that, which more than lends itself to this larger than life genre. Being chiefly a hybrid international production as far as I could ascertain - with an American director, a Welsh star, an Australian lighting cameraman (Robert Krasker), an Italian composer (Mario Nascimbene) and a Russian art director (Andrei Andreiev) it just made sense to employ a British visual effects supervisor (Wally Veevers). 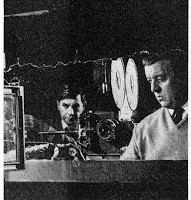 As I've mentioned here several times in the past, Wally ran the effects unit at Shepperton for many years, having had his on the job training as a visual effects cinematographer in the old Percy Day matte department through all those Korda films in the mid thirties. Wally's specialty, aside from effects camerawork was designing and constructing his own camera equipment and special effects rigging himself at home in his garage while listening, so I'm told, to country and western music (!) Now, normally I'd not give the time of day to ANYONE who liked 'country and western' music, but Wally is different. I've admired his work for years and feel agrieved for the man being robbed of his Oscar for 2001. In fact, alot of the miniature rigging and specialised photographic gear Wally used on 2001 and THE BATTLE OF BRITAIN was knocked together by Veevers himself at home with his fully equipped little workshop. Shepperton had a good sized matte department in the fifties consisting of chief matte painter George Samuels, artists Bob Cuff, Albert Julion, Joseph Natanson, Judy Jordan and later on Alan Maley, Gerald Larn, Doug Ferris, Peter Melrose and Bryan Evans. Matte cameramen Geoff Stevenson, Bryan Loftus, John Mackie, Peter Harman and John Grant all featured within Shepperton's hallowed halls at various times and together a great many excellent and sometimes ambitious matte effects were turned out. I fully intend to demonstrate many Shepperton mattes from various productions here on my blog at a later date, with such beautiful showcases as TAMING OF THE SHREW, DOCTOR ZHIVAGO, THE COLDITZ STORY, VALLEY OF GWANGI, ANNE OF THE 1000 DAYS, THE FEARLESS VAMPIRE KILLERS and many more, in addition to profiling Shepperton matte painter Gerald Larn. Wow, what a poster! This magnificent British Quad (the UK version of the US one sheet) is, sadly a thing of the past. Although Wally Veevers had effects credit I don't know who painted the particular shots, though it's a safe bet that George Samuels and Bob Cuff would have been principally involved. Sadly Bob passed away earlier this year folks. Admittedly quite an obvious painting, but I still like it and the fire element looks great. 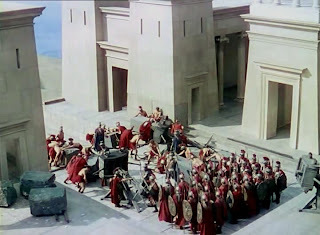 According to Gerald Larn most, if not all of the matte composite work was done using the colour separation dupe method and none of it as far as he was aware was original negative nor rear projection. One of the few original negative composites was done for David Lean's DOCTOR ZHIVAGO in 1965. A wonderful full painting of the army encampment at night with tiny flaming torch effects added. 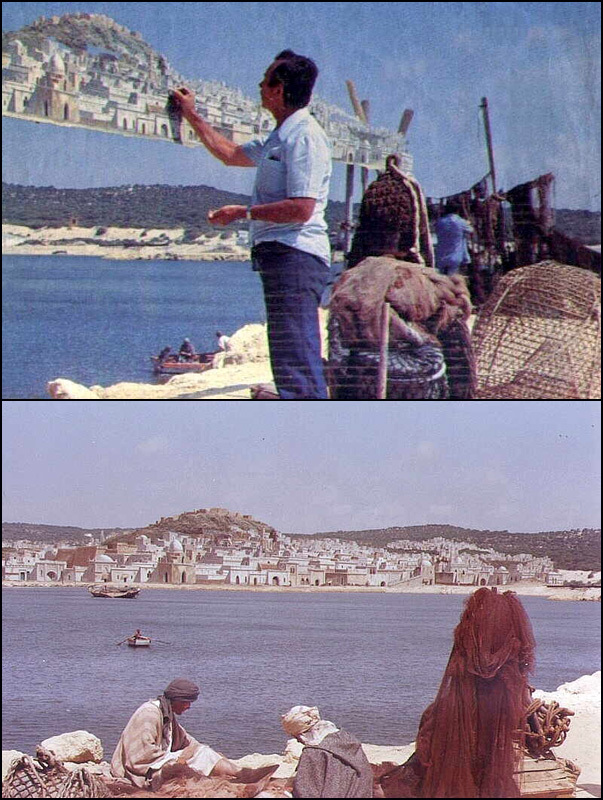 Although ALEXANDER THE GREAT predated Gerald Larn's tenure as resident matte painter by some eight years, these candid photographs of Larn at work in the mid 60's reveal that very night encampment matte painting ias llustrated above on the wall behind him amid a variety of Shepperton matte paintings from various films. Where these masterpieces ever ended up was a total mystery to Larn who said that they'd be there one day and gone the next - just where, nobody ever seemed to know, or care. 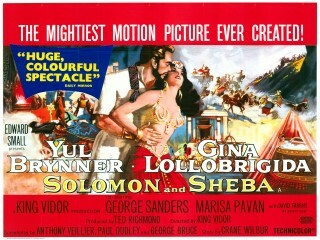 From conversations I've had with retired Shepperton matte painter Gerald Larn, the glass paintings were generally quite large at Shepperton, measuring six feet by three feet typically - a size long established as ideal by Wally Veevers, especially with the advent of CinemaScope in 1954. Frequently miniature elements were matted within areas of some paintings to lend a three dimensional aspect to suit particular requirements. Gerald Larn commented ..."the matte studio was long and narrow and consisted of four identical easels permanently fixed to the floor and the up and down motion of the heavy framed glass paintings was counterbalanced by weights that ran up and down in a boxed in channel, much like the old sash windows"
One of several painted mattes ruined with the superimposed map overlay. Same again - damned map! No, not a matte painting but in fact a scenic backing painted by Spanish matte effects wizard Emilio Ruiz Del Rio. 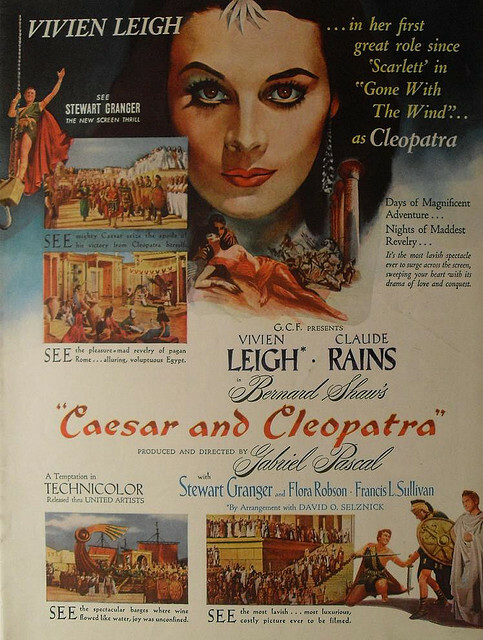 A big United Artists extravaganza, that although it's been 30 yeras since I last saw it I recall it as being a pretty okay sort of a show with the ever watchable Yul Brynner doing his stuff. Effects wise, it's a bit of a mystery. 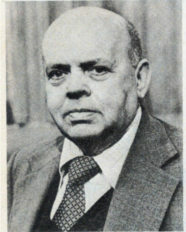 The only special effects credit was to Alex Weldon, a mechanical or physical effects specialist on many films. Photographic effects were not credited, so it's wide open to speculation as to who could have done these matte shots and the few great miniature set pieces as well. From my colleague Domingo Lizcano I'm reliably informed that Spanish miniaturist Francisco Prosper was involved in the model work, and by the look of the high quality effects shots the mattes may well have been in camera glass or foreground shots. My first guess would be Linwood Dunn's Film Effects of Hollywood, as he often supplied the visual effects work for United Artists product - or maybe Howard A.Anderson's effects house? There is also the distinct possibility of the matte shots all being completed in Britain with either Shepperton, Pinewood or MGM-Elstree being candidates. To me the work looks like that of Emilio Ruiz, though I don't believe that's ever been established. 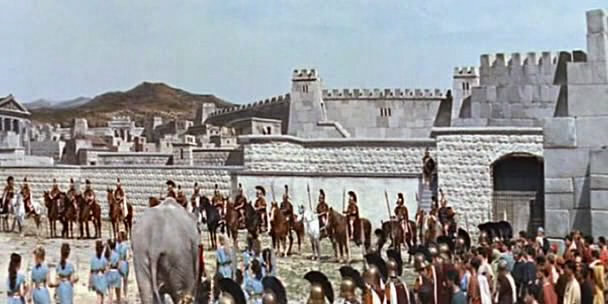 Typical of this film are the really impressive paintings and composites such as this. I'd love to know the origins of these. The last time I saw this was on tv in an awful pan and scan print which cropped off so much of the matte art. I'd almost go along with the 'foreground miniature' theory on this one. The light and shadows are perfectly matched. A really stunning matte shot with a terrific sense of colour value and matching to the location daylight and time of day. 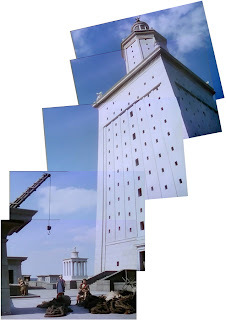 At left we may see the actual set as built, and at right the carefully placed foreground miniature with a tilt down camera axis. The clouds tend to look painted to me which makes the shot all the more baffling. In all likelihood the work of Spanish miniaturist Francisco Prosper. A Francisco Prosper miniature set where the army blinded by the intense sunlight reflected on the shields all stumble into the abyss. "oh the humanity"...... the devastation that is mandatory in this genre. Possibly a matte shot or painted backing? One of Emilio Ruiz's large painted backings. Another example of a large Emilio Ruiz painted backing. Up until now I've been mainly concentrating upon the American matte departments contributions to 'The Epics', though a great many were made by British studios, with a surprisingly large volume output by Spanish and Italian studios as well. 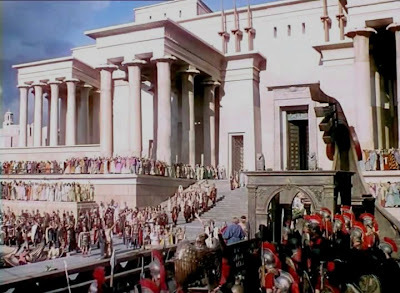 Naturally my recent post on Mervyn LeRoy's QUO VADIS was a fine example of British matte talent at it's very best - the legendary Peter Ellenshaw - who's work was extraordinary and among the most convincing of all Roman adventures. Today I will cover several films, although principally it'll be the 1945 Rank picture CAESAR AND CLEOPATRA, followed by a later UK epic with outstanding matte work, the 1965 Pinewood film KHARTOUM. I'll endeavor to also add a section on the extraordinary matte painted effects largely unseen (by me at least) from a selection of Italian and Spanish productions which may be unfamiliar to primarily English speaking film viewers. The huge Rank film based on the George Bernard Shaw play was for me a major disappointment. I loved PYGMALION, made by the same producers five or six years earlier - wonderfully witty and a total delight all the way. 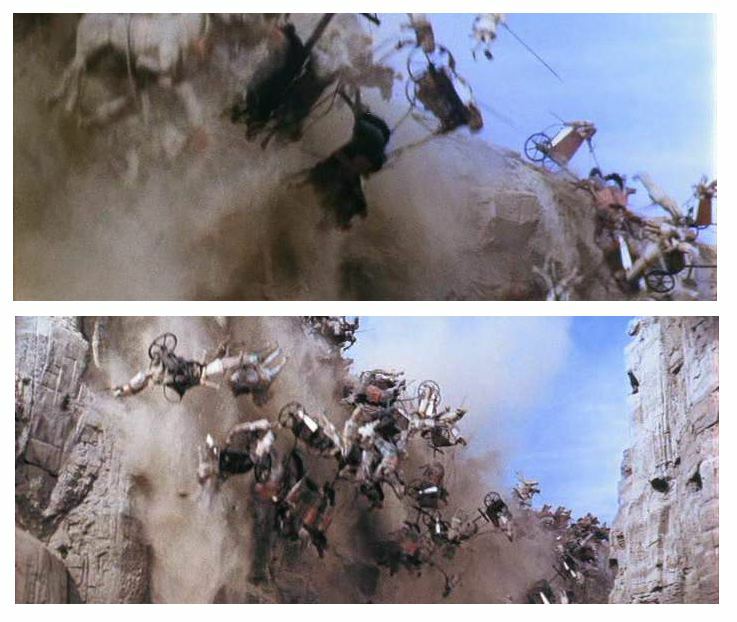 I just can't get my head around Bernard Shaw meets Ben Hur.... it just didn't work, period. 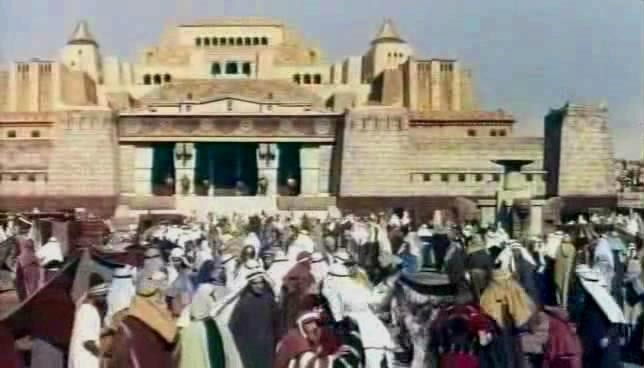 Apparently a hugely expensive film with such bizarre cost over runs as bringing a better looking and quality sand to Egypt (yes you read that right) "to ensure the right colour"! The money however is up there on the screen with mighty sets and decor - so good in fact that I find it damned hard to distinguish the real from the matte in many situations, so some of these frames are really a best guess on my part. 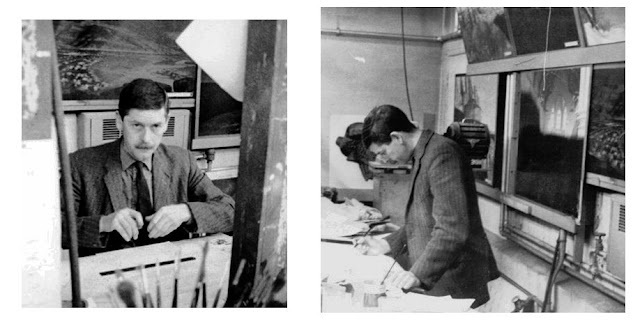 The special photographic effects were carried out be the doyen of British painted mattes, Walter Percy Day, or 'Pop' Day to industry insiders. 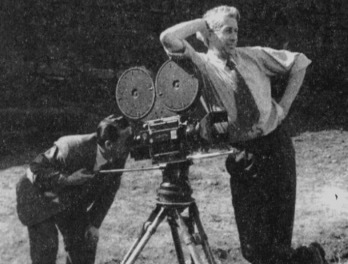 Day was the originator of the matte process in England and France and stood, rightfully so, as the father of the matte shot process for decades. As most people know Day was also the mentor (and hard taskmaster by all accounts) to a young fledgling matte artist named Peter Ellenshaw who himself would assume the mantle of matte master following day's retirement in the early fifties. A series of frames pasted together by Domingo Lizcano to illustrate a severe tilt down on what I assume could be a miniature, or even an actual constructed set. The shot is so good it's very hard to work out. If it were a miniature then Bill Warrington would have had alot to do with this effect. A magnificent effects shot whereby I'm guessing the matte line runs along above the lion statues at left and across the frame at approximately that same level. If so it is utterly superb in camerawork, painting and compositing. I think it's the Alexandria Lighthouse for memory - possibly one of the wonders of the world and the Pop Day painting is beautifully integrated into the live action footage here by effects cameraman Wally Veevers. 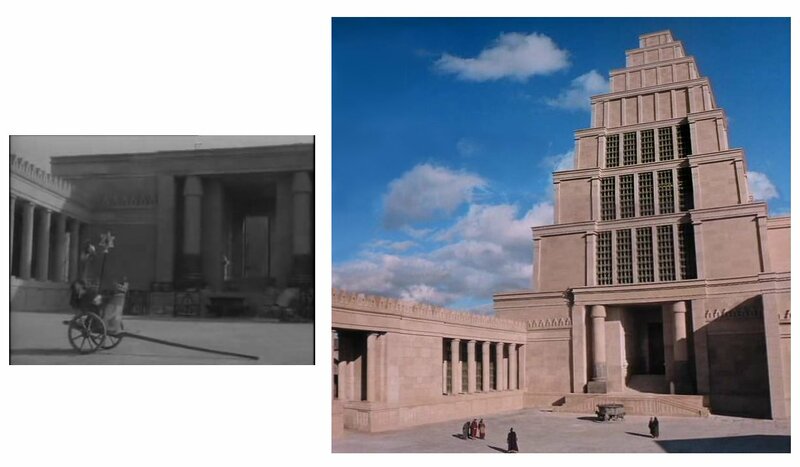 One of the numerous shots possibly achieved for real with expensive sets, or maybe matte art?? Again, the light and perspective are so convincing I'd tend to go with a foreground miniature perhaps? The same here - a jaw dropping visual effect that could possibly be a meticulously set up foreground miniature perfectly blended onto the outdoor set. I really don't know, but the shot is so damned good, with even the fire perfectly scaled. If it is a painted matte I can detect what looks like a soft split running midway along the brickwork of the wall, up and over the statue and across just above the heads of the furtherest away people. 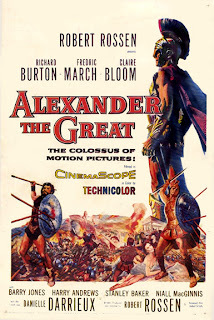 The Charlton Heston starred bio pic of General Gordon is quite good, and was Mrs Heston's favourite work that Chuck did. A badly miscast Laurence Olivier, in leftover OTHELLO black face as an Indian was a bit farcical, not to mention racially insensitive, but was the done thing back then for reasons I never fully comprehended. Now KHARTOUM is a good showcase for some of the best ever matte shots painted by Pinewood mainstay Cliff Cully - a painter who had been in the matte department at that studio since the mid forties working under Les Bowie and Joan Suttie, and presumably alongside a young Albert Whitlock. 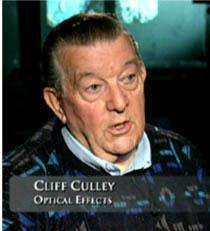 Cliff, who's long retired, did alot of mattework for Pinewood over the years, particularly in the sixties and seventies before going out on his own to form Westbury Design and Optical, an effects house specialising in mattes, miniatures and optical effects with Cully's son Neil as effects cameraman and other up and coming effects people on staff such as Steve Begg, Terry Adlam, Steven Archer and Leigh Took. One of the best matte shows the company produced were the terrific paintings for the Clive Barker horror film NIGHT BREED in the late eighties. Cliff's mattework here is in my opinion his best, with the beautiful wide painted views of the city from atop the sand dunes simply wonderful. 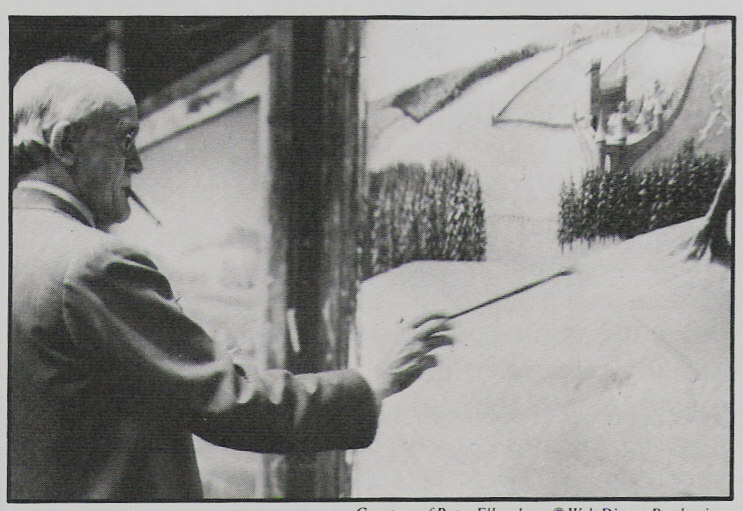 Around that time Cliff employed an assistant painter, Charles Stoneham, (pictured at right painting on Richard Attenborough's GANDHI) who also would paint on numerous British films right up to THE DARK CRYSTAL and BRITANNIA HOSPITAL in the eighties. Culley's long time associate Roy Field would have photographed the mattes and carried out the compositing. Roy too was a real trooper in the British film industry for decades on other big matte shows such as CHITTY CHITTY BANG BANG and culminating in an Oscar for the wonderful SUPERMAN - THE MOVIE in '79. The picture at left, taken in 1967 in the Pinewood matte department shows Field manning the 65mm matte camera while Culley touches up one of his large glass paintings for CHITTY CHITTY BANG BANG. A magnificent Cliff Culley painted vista that beautifully sets the flavour of the times. Culley's city with separate subtly blowing palm frond elements added in foreground. 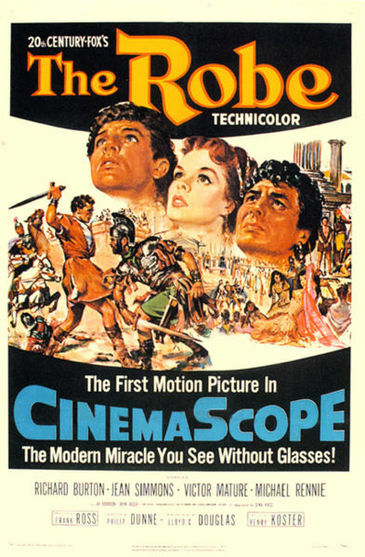 The classic and erroneous cliched 'binocular' effect - though Cliff's River Nile is terrific. A key battle sequence has several atmospheric skies added by Culley and Field. Another angle on the battle matte. A grand wide vantage point, superbly painted by Cliff, with on close moving examination what appears to be small slot gags in a few areas to suggest waving palm trees near the city wall. 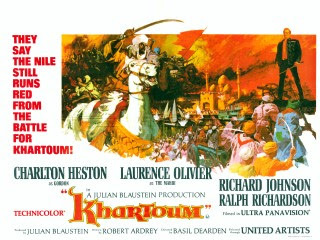 I think KHARTOUM was a 70mm presentation and as Pinewood was set up for 65mm matte photography I'd assume the elements and paintings would have received the old Ultra Panavision treatment. Almost all of these frames are from films I've never heard of and are from the exhaustive collection of Domingo Lizcano who has spent years collating just such effects shots. These frames are quite diverse and not all are strictly from the genre of epic covered in earlier blogs of this series, but the shots are terrific and I really want to give these matte artists some exposure. I had no idea until I found Domingo's special effects site some years ago just how many films were produced over the years in Italy and Spain in particular with often considerable numbers of matte shots and trick photography. Some of these films illustrated below fall into the 'sword and sandal' or 'peplum' genre - a genre I'll be the first to admit I just cannot personally abide. 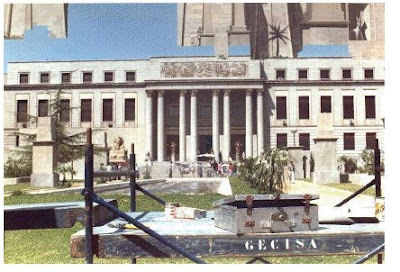 However the beautiful matte paintings seen in many of these easily warrant coverage here (and beyond this mere blog and in an official book on the topic of old school European visual effects in my mind). Emilio Ruiz del Rio - 'the maestro' in my book! I'll admit to knowing nothing about any of these films and knowing just a little on the visual effects wizards who produced these great shots, mostly gleaned from Domingo. Three names figure prominently in the matte shots of most Euro period films made from the 1940's through to the 1980's - those being premier Spanish matte painter and visual effects designer, the truly great Emilio Ruiz, an innovator par excellance with a extensive career in matte work. Another key name being Joseph (Jozef) Natanson - a Polish born fine artist who trained in matte art under Walter Percy Day at Shepperton in the 1940's, painting on numerous British films including THE RED SHOES up to around 1954. Both Ruiz and Natanson passed away within the same timeframe as I recall, just a few years ago. The third name largely associated with trick shots and matte art was Italian cult director Mario Bava. I was surprised to learn that Bava executed mattes and glass shots on a great number of his own films, such as the wonderful DANGER DIABOLIK and even on Dario Argento's INFERNO. 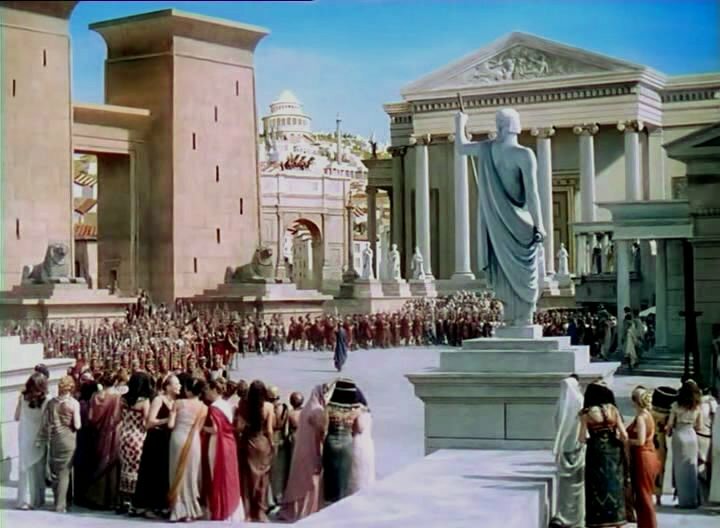 There are some dazzling examples that follow of some of Bava's glass shots from some Roman sword and sandal epics. THE FURY OF ARCHILLES (1962) Joseph Natanson matte shot - It's quite possible that Natanson painted the similar mattes of a Greek fleet for HELEN OF TROY as he was involved on that Warner Bros release, though based at Cinecitta at the time as well. 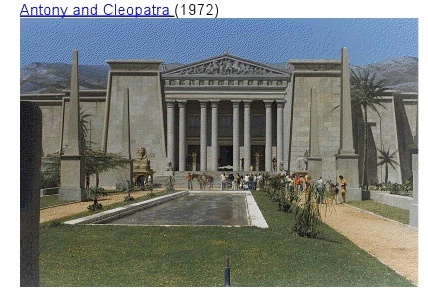 Joseph also painted on the huge Fox film CLEOPATRA, with fellow artist Mary Bone, created one of the vast panoramas of ancient Alexandria. Also from FURY OF ARCHILLES - painted by Joseph Natanson. Natanson glass shot from FURY OF ARCHILLES. 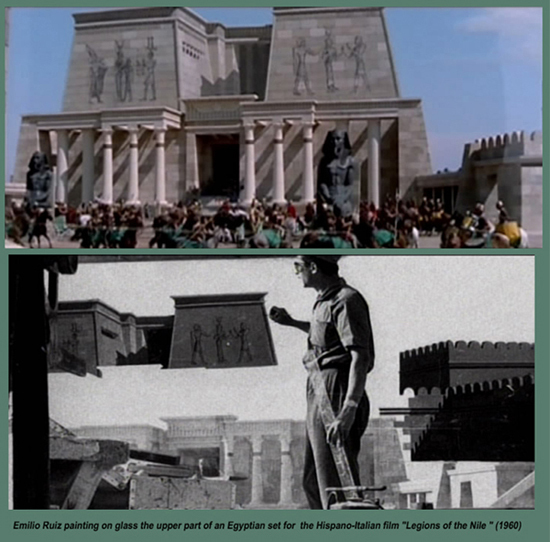 Emilio Ruiz practically invented the notion of using foreground flat two-dimensional panels of art applied more often that not to sheets of aluminium carefully positioned to merge reality and fantasy into hundreds (or thousands) of flawless trick shot composites throughout his very long and very distinguished film career. Among the notable genre films that feature Emilio's great trick work are Ray Harryhausen's wonderful GOLDEN VOYAGE OF SINBAD (1974). 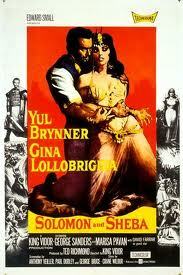 Another Ruiz masterpiece - THE LAST DAYS OF POMPEII - a 1959 version I never knew about till now. 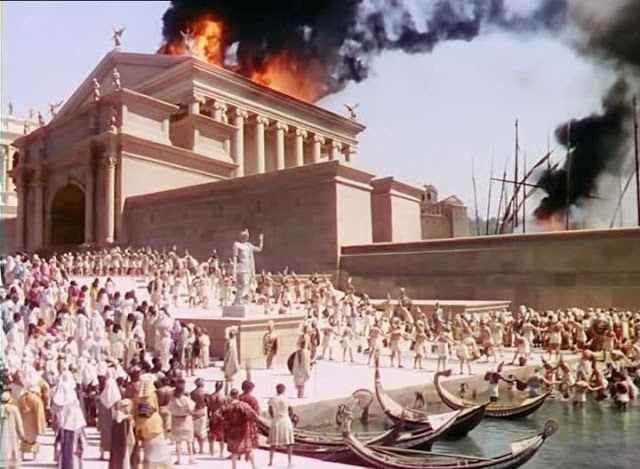 A story unlike any other I suspect, MEDUSA AGAINST THE SON OF HERCULES (1962) Ruiz glass shot. 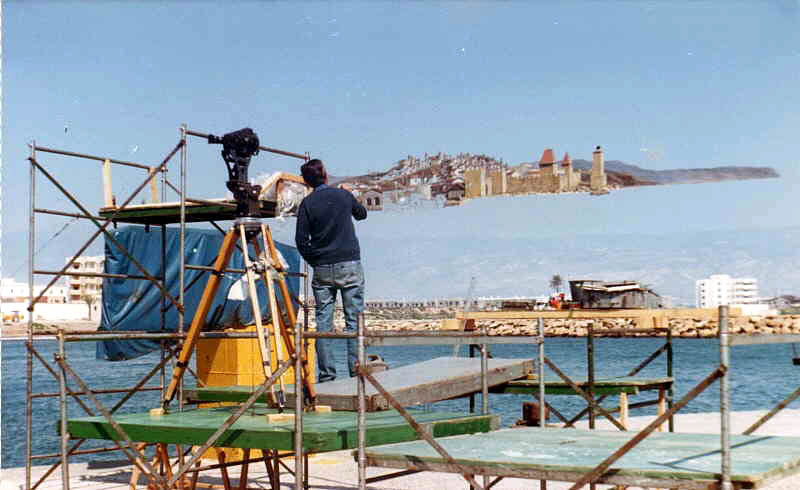 Another painted Ruiz effect, from the same film. 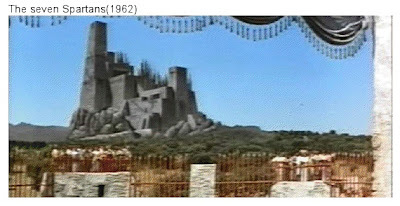 Emilio's painted city gates and walls from above titiled 1963 film. 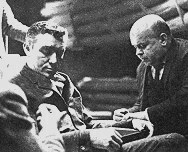 In addition to these probable hundreds of Italian and Spanish films, Emillio worked stateside too on a number of films, often for producer Dino DeLaurentiis, whom I suspect he knew from Dino's European days. 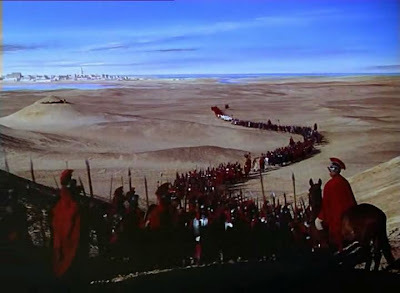 Some of the films Ruiz painted on or created amazing foreground miniatures were DUNE, the two CONAN films, RED SONYA (with his miniature of the skeleton bridge integrated with an Albert Whitlock matte painting of a foreboding sky) plus many shows for Enzo Castellari such as THE INGLORIOUS BASTARDS and EAGLES OVER LONDON - Tarantino's favourite director. I don't know how many trick shots Emilio did, but it must number the thousands, and as far as I know he was still working practically up till his death in 2008. ...and Emilio Ruiz' foreground painting awaiting alignment for the camera. A wonderful demonstration of the skills that made Emilio Ruiz Spain's secret weapon and a leading visual effects artist. A matte deceptively not belonging in the period under discussion, but included all the same as a great work in progress. I really only knew Bava by his Barbara Steele films and horror, so this aspect of Mario is quite a surprise to me.